Wellll….the Alabama State Department of Education (ALSDE) is giving everyone…and I mean everyone….the opportunity to state whether they agree or disagree with any of Alabama’s English Language Arts (ELA) or math standards. This is your chance, folks. Speak now. Make. The. Time. 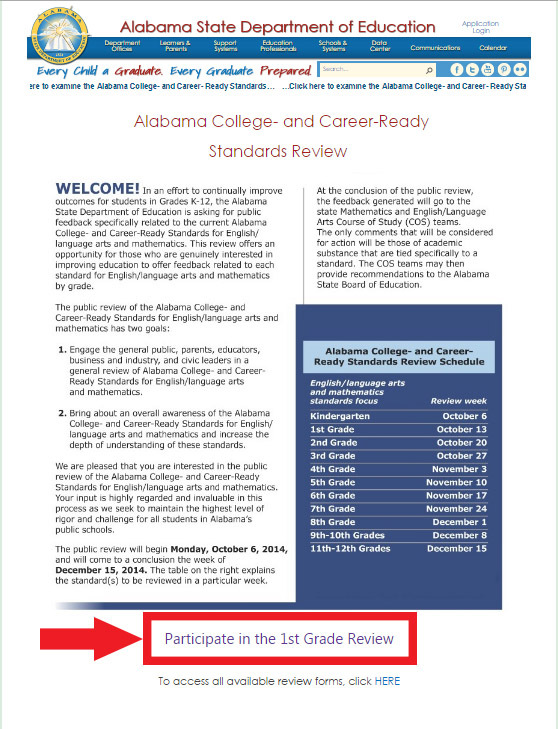 Beginning on October 6, the ALSDE began posting one grade level’s ELA and math standards each week for us to review. Kindergarten was last week. First grade is this week. Second grade is next week. And so on, through the end of the week of December 15. 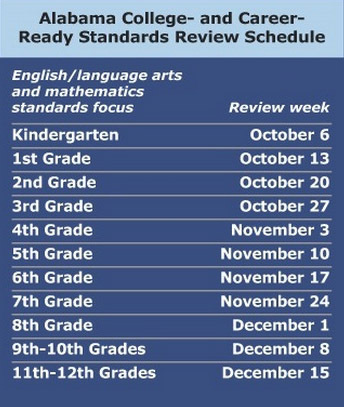 And yes, all grade levels’ standards will be available to review once they are posted online should you (accidentally) miss a week’s standards. 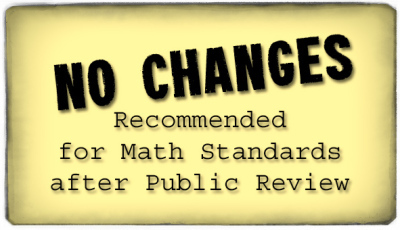 If you’d like to see all grade levels’ standards for ELA and math, click here to review all grade levels of ELA standards (beginning on page 23 of the PDF), and click here to review all grade levels of math standards (beginning on page 22 of the PDF). 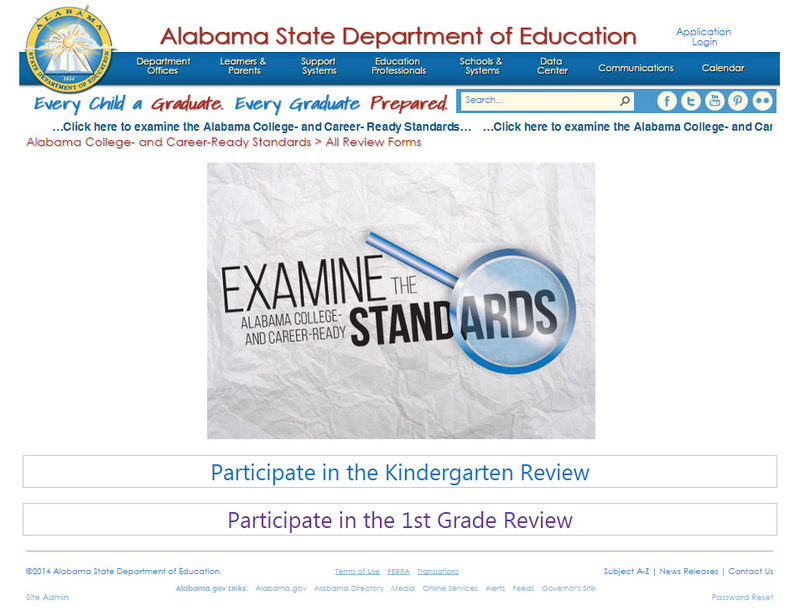 The ALSDE has set up an interactive form on their web site to lead you through the process. The images below are screenshots from the ALSDE’s web site and are presented in order to allow you to know what to expect before you engage in the process. Click on any image to make it larger. and then you’re given the opportunity to provide your email address, if you wish to do so. Then you will be asked if you wish to continue the review. At this point, let’s assume your answer is “yes”. You’ll choose a subject, ELA or math. Then you’ll choose a standard. 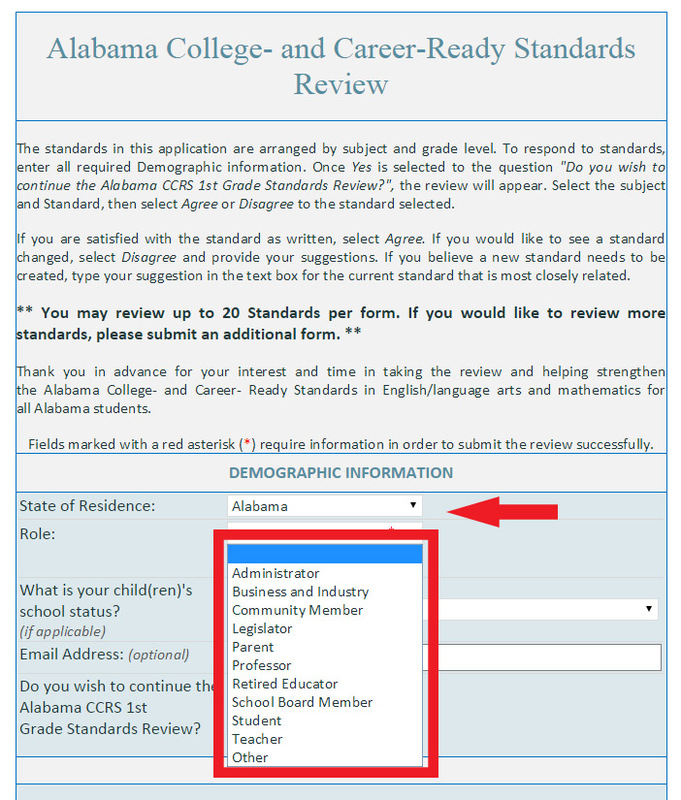 Any uniquely-Alabama standards, i.e., not a part of the Common Core State Standards, will be indicated in parentheses. Choose a standard. And then indicate whether you agree or disagree with the standard. In the example below, “disagree” has been chosen. You are asked why you disagree and are given an opportunity to explain how you would change or rearrange or rewrite the standard. 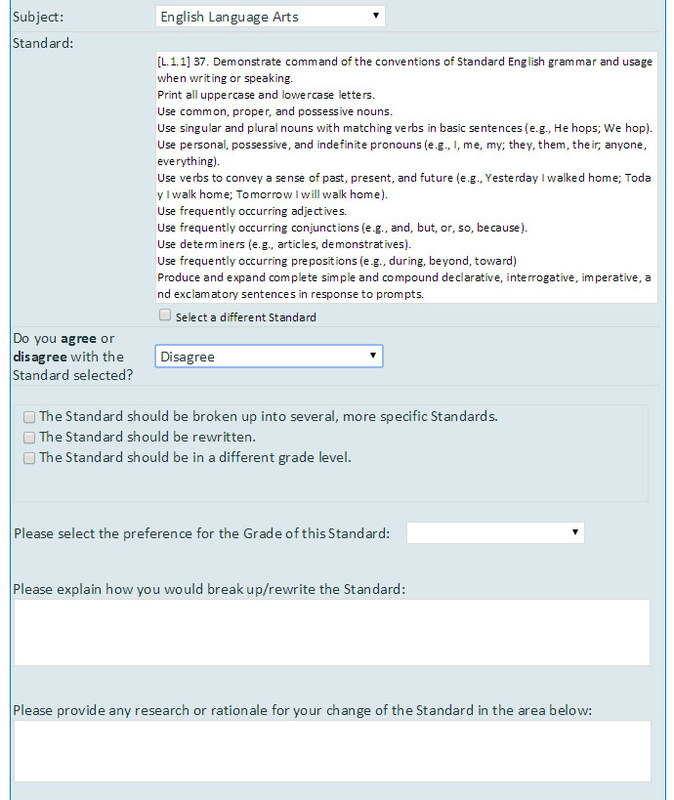 Once you hit “submit” (which is the next step), you are then given an opportunity to choose another standard. And remember, if you wish to go back to a previous week’s grade level, you can do so. There’s a link at the bottom of the home page for the review: “To access all available review forms, click HERE”. You can give input on up to 20 standards each time you start a new session. State Board of Education members were given a tour of that process at the October 9 Board Work Session. The entire clip of that tour can be viewed below. In the clip, seated from left to right, are ALSDE representatives Karen Porter, Education Administrator, Office of Teaching and Learning, Dr. Michael Sibley, Director of Communications, and Dr. Julie Hannah, Director, Office of Student Learning. ALSDE representatives repeatedly indicated that ALL feedback is welcome. Board member Betty Peters asked whether what amounts to an “interpretive guide” will be posted for parents to better understand the language contained in the standards, but no promises were made. Board member Stephanie Bell confirmed that all input is anonymous, unless you choose to provide your email address. At the conclusion of the public review, the feedback generated will go to the state Mathematics and English/Language Arts Course of Study (COS) teams. The only comments that will be considered for action will be those of academic substance that are tied to a specific standard. The COS teams may then provide recommendations to the Alabama State Board of Education. State Superintendent Dr. Tommy Bice confirmed next steps, saying that the COS teams would be convened in January and February to review all comments and then if changes are recommended, those changes will be brought to the State Board of Education for review in February and March. 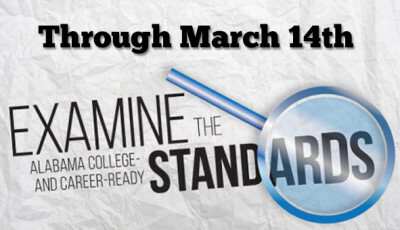 Prior to Bice’s tenure, standards were only updated cyclically, every six years. 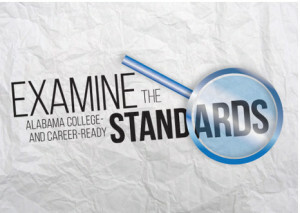 However, since the Alabama College and Career Ready Standards for ELA and math were adopted in 2010, input has been taken from educators continually, resulting in adjustments to standards in January of this year. Porter indicated that about 80 responses had been recorded as of last Thursday morning. Where are you folks who wanted to provide input?? C’mon, friends. We have been given an unprecedented, wide-open, few-holds-barred opportunity to give our input (even if we hardly know what we’re talking about) on WHAT IT IS our children are learning in school, at least in broad terms. Don’t let this opportunity pass you by. Set aside time this weekend. And every weekend. How much does it really matter to you? We will likely all be judged by participation in this incredibly generous exercise in public participation. Please let’s not blow it. Please. For an incredibly thorough history of Alabama’s involvement with the Common Core State Standards Initiative, read this from A+ Education Partnership. Science Draft Course of Study Available NOW for Your Input! This review process is so cumbersome that I doubt it will be very effective, but I appreciate the effort made to give citizens an opportunity to be heard. I wish there could be a way for them to really see what it looks like in classrooms where teachers, who have studied these standards at length, worked in teams to clarify their understanding of what is meant by each one, selected materials and instructional approaches (including interactive technology) to make sure students can demonstrate their understanding of each part of each standard, actually bring these wordy sentence fragments to life! As a retired educator now working in Alabama schools on a part-time basis, I have seen it and it is good! I began teaching in Alabama in 1973 when one small paperbound booklet contained all there was to know about what should be taught grades 1-12. This book usually remained on the shelf. I believe that Alabama College and Career Ready Standards hold great promise for our students if we can remove our conversations from the political arena and instead focus on providing support and encouragement to our educators. The ones I have observed are working very hard to make our children ready for productive life in today’s world. Thank you so much for your comment, Melissa. Yes, the process is cumbersome, but that seems to be the process for much of this stuff for much of the time. I agree with you in that the impact of standards is found in the classroom. This review process is so cumbersome that I doubt it will be very effective, but I appreciate the effort made to give citizens an opportunity to be heard. I wish there could be a way for them to really see what it looks like in classrooms where teachers, who have studied these standards at length, worked in teams to clarify their understanding of what is meant by each one, selected materials and instructional approaches (including interactive technology) to make sure students can demonstrate their understanding of each part of each standard, actually bring these wordy sentence fragments to life! As a retired educator now working in Alabama schools on a part-time basis, I have seen it and it is good! I began teaching in Alabama in 1973 when one small paperbound booklet contained all there was to know about what should be taught grades 1-12. This book usually remained on the shelf. I believe that Alabama College and Career Ready Standards hold great promise for our students if we can remove our conversations from the political arena and instead focus on providing support and encouragement to our educators. The ones I have observed are working very hard to make our children ready for productive life in today's world.